The Tampa Bay Rays-Miami Marlins baseball game was a relaxed setting where Wounded Warrior Project® veterans and their families shared experiences, created new memories, and learned about how WWP programs can heal their bodies and minds. ST. PETERSBURG, Fla. (June 3, 2017) – As Mike Jernigan emerged through a portal from one of the darkened hallways onto Tropicana Field, his senses were aroused by a mix of lasting baseball memories and eruption of bright colors. “You never forget the colors of green grass, red clay, and white lines,” the Marine Corps veteran said. Although blinded by an improvised explosive device 13 years ago during combat, Mike said a recent Wounded Warrior Project® (WWP) outing to a Tampa Bay Rays-Miami Marlins game allowed him to relive some of the best moments of his life – including the vivid colors. WWP program events like this give wounded warriors an opportunity to experience firsthand what is possible at social gatherings that get them out of the house and connect them with fellow service members and their communities. The ball game was a relaxed setting where veterans and their families shared experiences, created new memories, and learned about how WWP programs can heal their bodies and minds. 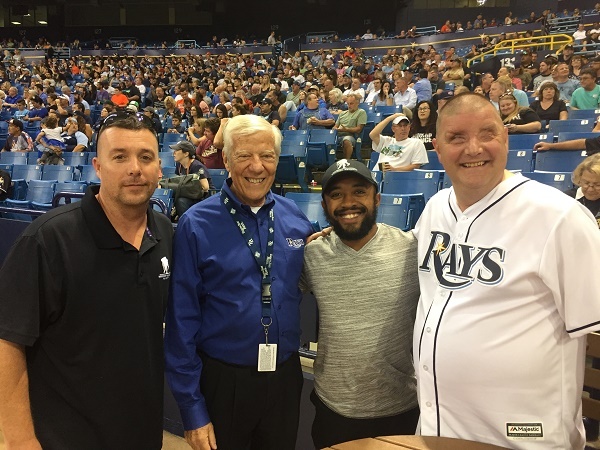 National Guard veteran Donald Elsner enjoyed being with his family and watching the Rays because it reminded him of going to games with his older brother when he was a child. When his son caught a foul ball, it marked another fond baseball moment for Donald – and a new one for his son. Attending the game and connecting with fellow warriors became another important – and necessary – step in the healing process for Army veteran William Pontes. “During my first tour, I made three silent promises to myself while I was sitting on the roof of an old Iraqi building,” William said. “One of them was to see more baseball. When I got home, I realized large crowds made it nearly impossible to see the game I love. Because of the programs and therapy I got from Wounded Warrior Project, I can enjoy ball games again. Exposure to traumatic combat and operational experiences affect service members and veterans spiritually, psychologically, biologically, and socially. WWP events provide safe, private environments for warriors to express themselves, share their experiences, and set achievable goals for their recoveries. For Mike, that means continuing to enjoy the game he loves. “My grandfather was a baseball scout, but I grew up in a military family, and we weren’t close to a Major League Baseball ball park,” Mike said. “When I went to New York in 1992, I got to see Yankee Stadium. The Yankees played the Baltimore Orioles – you don’t forget something like that.